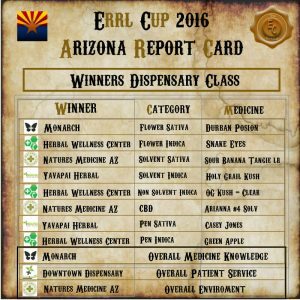 The Errl Cup was held on Jan 9th in Tempe, AZ. It was a amazing success for patients, vendors, and dispensaries. We hope everyone that came got to visit all our vendors and enjoyed themselves. 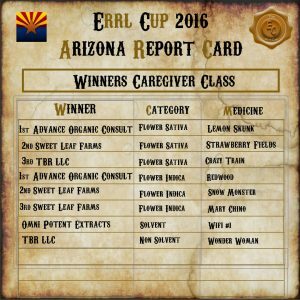 We were happy to put on the first ever Cannabis Awards and Festival in Arizona and happy to give you the Errl Cup results . As well as the First Errl Cup, one of many in Arizona and other states across the western United States. Here our the results to the caregiver and dispensary categories. We will be putting up all the Errl Cup results and the information on each dispensary and what they have given in the way of medication and what the medication real THC was, and what other important facts you need to know about your medicine. We need to take this fight head on, the power is in the patients hands. We are starting a committee to do secret shopping around the Valley, with the New Times publishing our results and making a better community and a better medicine for not just the patient but also for the dispensary. Because the dispensaries that put out the top quality medication to its patients is the way both the patient and the dispensary will prosper. They need to work together, I know both the Patient and the Real Dispensaries do care about what medicine that you intake. We hope you enjoy the time at the Errl Cup, if you missed us please keep us on your favorites list because we are going to more locations. Here are the winners of the Annual Errl Cup held on 1/8/16. They are listed in two classes, dispensary and patients. All testing was done by our selected lab after our interview process. See you at the Cup.